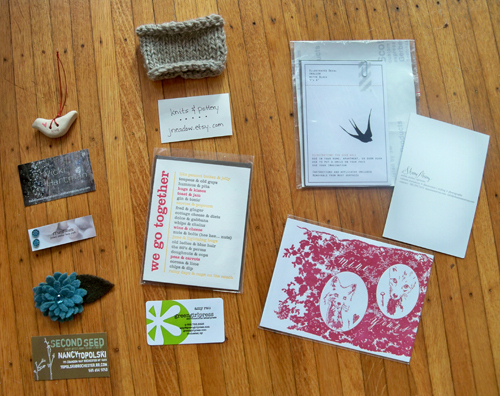 Every year I miss a really cool indie craft show in Rochester because we go home to PA for Thankgiving. I was really excited to see that Java's was having a craft show for Valentines Day. There were so many cute things, I did get a few. I tried to match the goodies up with the creator, but I was shoving things in my bag willy nilly, so I hope I didn't switch them up. Starting at top going clockwise. Aw, I'm so sad I missed this! I need to stop at coffee places more often. Aw I didn't realize you didn't know about it. Are we friends on Facebook? I'm pretty sure we are, but I think I need to pay more attention to it. I tend to miss out on things.